Yes, I know, another ball joint thread, but I can't seem to find out how to use the Advanced Auto Ball Joint tool. The knuckle kind of gets in the way, and I don't know which way to press it out. Press from the bottom or the top? You cannot "press it out" the ball joint is removed from the spindle with it clamped in a vise and a suitable hammer and drift is used to pound the boll joint out! A suitable hammer is likely a 6 pounder which you will swing like a baseball bat! A suitable drift will likely be a large heavy socket! I have a socket which has a two foot long wire handle welded to it, put the socket on the bottom of the ball joint holding it there with your left hand and then applying the hammer from overhead with the right hand, repeat as necessary! Why can't I press it out? And I still don't know which way to force it out. It comes out from bottom to top. You would do well to follow the good advice in post #2. Then, when it's time to install the new joint, find someone with the proper MB press and forget the generic press. Last edited by tangofox007; 12-16-2009 at 09:04 PM. Reality! Because the Chinese recycled chevy tool you're trying to use is incapable of exerting enough force to do so! Not to mention that the tool you're attempting to make use of will not allow you to position it to apply any force that could move the ball joint from the spindle. The ball joint needs to be forced from below, upwards and outwards from the cup of the spindle where it resides. There is no way to position the head of the tool so that it makes contact with the spindle as you would apply forcing power to the bottom of the ball joint. 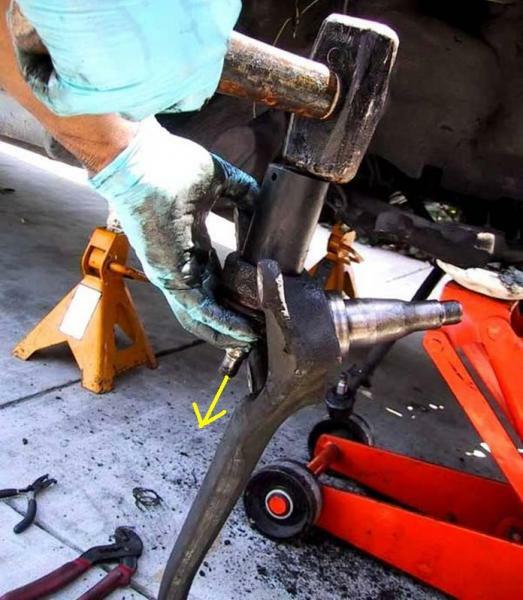 Below is a pic Deliveryvalve sent me showing how he removed his Ball Joint. I added the Yellow Arrow to show the direction it comes out. He is using a Socket as the Punch to knock out the Joint. Note that the Steering Knuckle is upside down. The Factory Service Manual shows it upside down but with part of it held in a Vice so that you can Beat the Joint out. Definitely needs to be hammered out. The Autozone press will only press the joint in. I used a large hydraulic press at work to do this. I was amazed at how much force was needed. Something like 10 -12 tons. If you can't get it out with a hammer let me know. I can bring it to work and get it out for you. sometimes a little bit of heat helps - be careful, and a bigger hammer!! Be careful not to bend the Knuckle !! I supported the knuckle with a piece of heavy walled steam pipe located so that the crook ball joint slid into it. I had previously tried to use a 15 ton press, waste of time! it was ok for pressing the new joint in. And only then by pressing on the wrong part of the joint, which all but guarantees that the joint will be at least somewhat deformed in the process. Sorry but this statement is false. Could you provide a picture of the generic press being used in such a way that is applies pressure to the ball joint flange? Every example that I have seen shows the press applying pressure to top of the housing in a way that is guaranteed to deform the part. The deformation may not be easily detected by the average shade tree mechanic, but it occurs nonetheless. 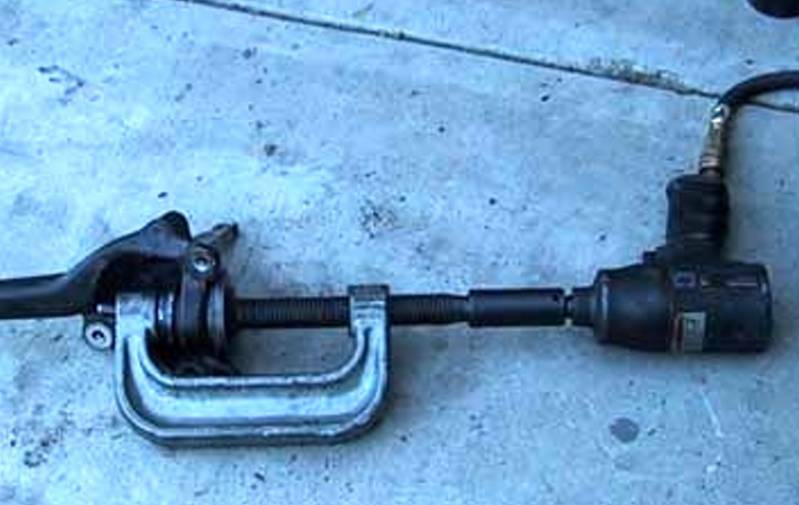 I have personally seen one ball joint that was completely loose (meaning that the ball flopped around in the socket) following installation with a generic press. That may have been an extreme case, but there is no doubt that some deformation occurs in any case. Last edited by tangofox007; 12-17-2009 at 11:50 AM. I edited another pic Deliveryvalve sent me to blow up only the part of his pic I wanted. Also I do not remember where he got the Press. The thing is that when you use Generic Tools to do a job you nave to work with more care and have to make a decision if you want to take a chance on the tool or not. If you see that the Generic Press is not pressing the Ball Joint in straight you have to stop before you cause dmage. When I did mine I knocked out the old joint the way it shows in the picture posted above but I did my best to suport the steering knuckle so it wouldn't get damaged. To press in the new ball joint I took the knuckle and joint to a local indi shop that had the factory tool and they charged around $25 each but after watching them do it I was glad to pay them. I used the cheeepo press w/ lemforders 18 months(35K)ago, and it did the job, but now the last week or so I am hearing what sounds very much like a squeaking BJ. maybe its not a BJ( too cold to bother looking), maybe its a bad part, maybe I did it wrong, maybe the tool shortened the lifespan.